There is nothing better than crunching on a fresh, juicy apple. Apples are one of the most commonly consumed fruit types, likely due to their convenience, flavor, variety, and availability. There are thousands of known apple varieties in the world, however, in the United States about twenty or so are commercially available. They range in color (from red to green to golden), flavor (from sweet to tart to tangy), and texture (from mealy to crisp to soft). There are countless reasons to add any variety to your diet. One medium apple contains about 95 calories and 25 grams of carbohydrate. That's about the same amount of carbohydrate as two slices of bread. Some of the carbohydrate in apples comes from fiber (about 4.4 grams), but most of it comes from sugar. If you are trying to watch your carbohydrate intake you may want to choose small sized (4 oz or the size of a tennis ball) apples to keep your carbohydrates to about 15 grams for about one serving of fruit. And keep in mind that some very large apples can contain as much as 35 or more grams of carbohydrate. The glycemic index of apples is estimated to be 38. The glycemic load of a medium apple is about six. Apples provide less than one gram of fat. Apples are not a good source of protein as there is less than one gram per serving. Apples provide important vitamins and minerals. You'll get 8.4 mg of vitamin C in a medium apples, or 14 percent of your daily recommended intake. You'll also get smaller amounts of vitamin A, vitamin B6, vitamin K, riboflavin, thiamin, niacin, and folate. Minerals in apples include potassium, manganese, copper, magnesium, phosphorus, calcium and iron. Apples contain many nutrients that can provide health benefits. When eating apples try to eat the peel—which contains chromium, a mineral that is important in assisting insulin action. Insulin is the hormone that helps to regulate blood sugars, enabling sugar to be utilized for energy. Also, the apple peel contains a greater percentage of phytonutrients when compared to the flesh of the apple. Lastly, the peels can aid in satiety because they contain fiber. Apples are also an excellent source of fiber. 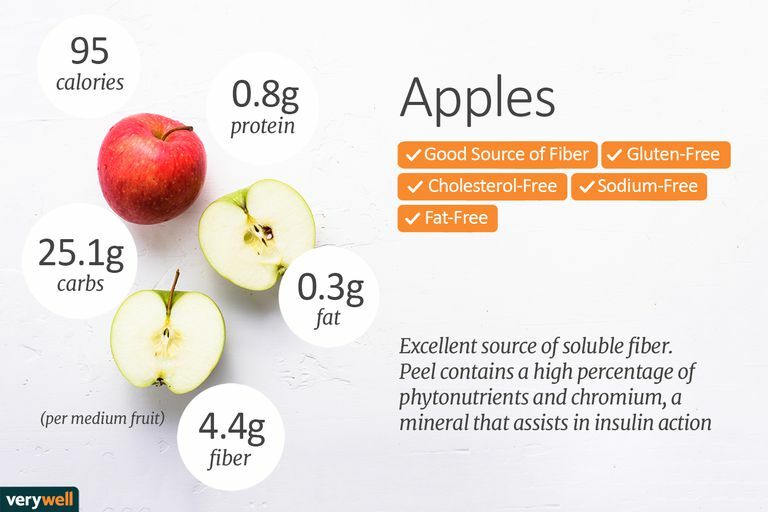 About one-third of the fiber in apples is soluble, mainly pectin. Research has shown that foods rich in soluble fiber can help to lower cholesterol. A diet rich in soluble fiber can help to pull cholesterol out of the body. Aim to get in at least 25 to 38 grams daily. Fresh apples are an excellent source of quercetin, plus they also have a large number of polyphenols. Quercetin is a type of phytochemical known as a flavonoid, which is found in the apple skin. Animal research and research using cell cultures have found that quercetin may help to protect against certain cancers and help to kill cancer cells. Notably, these types of studies can suggest possible helpful effects but they do not provide proof that such effects can be achieved in humans. Preliminary studies also suggest that quercetin may help reduce the risk of heart disease. Apples may also have positive effects on the bacteria in our colons. This is an area of research that is now receiving a great deal of attention. It appears that a healthy gut can help to prevent disease and maintain good health. Note that processing apples reduce the nutrition profile significantly—most bottled clear apple juice at the supermarket contains only a small fraction of the nutrients that were in the original whole fruit. Are there any nutrient differences between varieties? Before discussing different varieties of apples, it's important to note that the size of an apple is a major determinant of calories, carbohydrate, sugar, and fiber content. Aim to avoid the colossal sized apples, as these can have as many carbohydrates as two or more servings of fruit, not to mention that they have probably been farmed using genetically modified ingredients. Instead, opt for a small apple, the size of a tennis ball. And if you can, purchase organic apples, because apples are on the dirty dozen list and carry more pesticides than other fruit varieties with thicker skins. Different varieties of apples will have the same amount of calories, carbohydrate, and fiber if they are the same size. In addition, they all have similar vitamin and mineral profiles. However, if you don't eat the skin of an apple, you will miss out on some of the chromium and a large portion of the fiber and polyphenols (plant compounds that have antioxidant power) which can be cardio-protective and protect against certain cancer. There is limited research as to which type of apple is the healthiest to eat. But we do know that red-skinned apples contain anthocyanins, which are compounds that act as antioxidants. If you like red apples, this is a bonus. Modern storage techniques make apples available all year, with peak season being in the fall. What is the best way to choose and store apples? Choose apples that are smooth without blemishes, soft spots, or bruises. Badly bruised or rotting apples emit ethylene gas that can speed the spoilage of other produce, therefore they should be discarded immediately. Store apples in the refrigerator. Properly stored apples can last for up to six weeks. Avoid washing until just before use, but make sure to wash them well to remove pesticides and wax. There are many different ways to purchase and enjoy apples. In addition to fresh apples, apples can be purchased as applesauce or dried apples. Choose applesauce that has no added sugar and note the serving size of dried apples. Dried fruits tend to have more calories because they are concentrated. The juice from apples is used to produce apple cider vinegar and can be a good product to use in cooking. In fact, a study published in the Journal of Functional Foods found that healthy individuals at risk for type 2 diabetes who ingested 8 ounces of Bragg Organic Apple Cider Vinegar Drink Sweet Stevia for 12 weeks led to significant reduction in fasting blood sugar than the control group. The authors suggest that adding just one tablespoon twice daily may help to reduce fasting blood sugars. While apple cider vinegar is unlikely to be a cure-all for diabetes (no one food is), there is no harm in trying it out. Toss some apple cider vinegar into your next salad or marinate your protein in it. Apples are a very versatile food. They can be eaten at any time of day and incorporated into all meal types. Chop apples and toss them into oatmeal with cinnamon, or top whole grain pancakes with yogurt and apple slices. Toss some apples into your salad for lunch or incorporate apples into your side dishes to accompany proteins like baked chicken, turkey, or pork. Apples are also used is a variety of baked dishes, including bread and desserts. Classic dishes prepared with apples are often referred to as a la Normade. When baking, applesauce can often serve as a substitute for fat, adding moisture and softness without all the added calories. You could also make your own juice. Some people who suffer from oral allergy syndrome (OAS)—also known as pollen fruit syndrome (PFS)—may experience symptoms after eating apples. In addition, people with hayfever caused by pollen may experience a reaction after eating an apple, according to the American Academy of Allergy, Asthma, and Immunology. Symptoms may include itchiness, swelling of the mouth, face, lip, tongue and throat immediately after eating or up to an hour afterwards. Severe reactions may include difficulty breathing or swallowing. If you experience allergic symptoms, seek medical care and talk to your healthcare provider about personalized allergy testing. Daniels, Steven. Food navigator-usa.com vinegar beverage shows blood sugar management potential.